West Ham striker Carlos Tevez has turned down a move to Inter Milan after the Italian champions imposed a deadline for him to make a decision. The 23-year-old has been linked to several clubs in England and abroad but is keen to stay in the Premier League. A statement from Tevez's representative Kia Joorabchian said: "Inter put a deadline on the decision and Carlos' heart is really in the Premier League. "He was not prepared to meet that cut-off point put on him." Tevez said in May that he was keen to move away from Upton Park saying: "I want to join one of Europe's big clubs, that's what I've talked to my agents about." Joorabchian, though, insisted that the Hammers are in talks to keep the Argentina international but played down reports of a £115,000 per week being offered to convince him to stay. The Iranian businessman added: "That is "absolutely not true". "He has not been offered that sum of money to stay, but it is true we are still talking and hope to come to some arrangement." Arsenal, Real Madrid, Liverpool and Inter were among the clubs strongly linked with a move for Tevez but Inter have ruled themselves out of the running due to their demands. 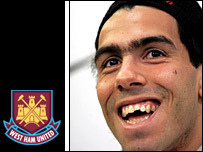 Will Tevez stay at Upton Park for another year? Inter president Massimo Moratti told his club website: "Tevez is no longer a target, we are fine as we are in attack." The forward was instrumental in the West Ham's successful battle to avoid relegation last season after a difficult start to hi Upton Park career. Tevez moved from Corinthians last summer but the Hammers were subsequently fined a record £5.5m by an independent commission for breaching Premier League rules. Keith Peacock has left the coaching staff of West Ham to take a break from football and spend more time with his family.